HB Digital specialise in the supply, installation and maintenance of a full range of business telecoms systems including standard analogue, ISDN, broadband & VOIP solutions. 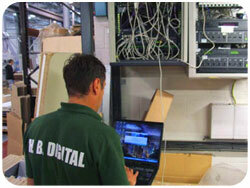 We realise that if you lose your communications you need a fast efficient service and fault resolution. Most of our customers prefer annual maintenance contracts with agreed response times to ensure they are back on line with a minimum of disruption. We can supply, install and maintain most other systems, please enquire for more details. Through our business partnership with NT Voice & Data we are able to provide highly competitive rates on your telephone line rentals and call charges. Our business phone lines work really hard for you. They’re super reliable and use the Openreach network, also you can choose from a huge range of voice features to make the most of your organisation’s voice calls. In most cases, you’ll be able to keep your old number(s) too. It is a simple seamless process to transfer your existing lines to us and we will be able to save you as much as 50% off your current monthly phone bills. Please ask for a written quotation to identify exactly what your business can save. Maybe even more importantly than cheap prices you will receive a prompt response and our personal service to all your enquiries. Our professional business phone installers cover all of north Wales, Llyn Peninsula, Anglesey and the North West. Whether you’re running a hotel or B & B, guests expect more from you now than ever before and every interaction with them becomes an opportunity to build customer loyalty. An effective hotel phone system allows you to offer your guests additional facilities that add value, while delivering unparalleled customer service, a major differentiating factor in this competitive industry. It also helps you keep your costs to a minimum and make the most of your staff and resources. A smart hotel phone system such as Ericsson’s iPECS UCP provides features that help you deliver personal service and better value to your guests. In many hospitality environments, more than 80% of staff are mobile and so access while on the move is critical. 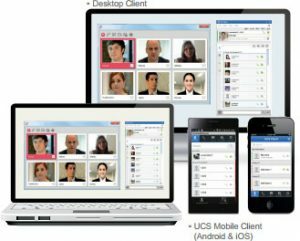 The iPECS delivers integrated WiFi, DECT or smartphone and PC apps to ensure that every member of your team can always be contacted. Each team member is given a virtual voicemail box allowing their voicemails to be delivered to their email address for them to collect on a smartphone/tablet or PC. This keeps your hotel and your team connected, without the need to spend a small fortune on handsets. The iPECS has a distributed architecture – this means that connectivity can be provided around the entire hotel without expensive cabling costs. If you have a number of separate buildings such as a spa, gym or restaurant, these can all be serviced from a central system by simply adding a module to the main system. This keeps your costs to a minimum and makes monitoring and maintaining the system more efficient. The iPECS is also the greenest choice – offering you the world’s lowest power consumption of any telephone system. The iPECS delivers a host of features to further enhance your guests’ stay, helping you to stand out from other establishments. Guest voice mail box: This allows for external messages and messages from e.g. the concierge. A lamp on the phone indicates a message is waiting, and the guest then can retrieve it (and even return it) with a single touch. Wake up calls: This lets guests set their own, or ask the front desk to do it for them. You can even play a wake-up message to the guest. ‘Meet-me’: This provides a valuable conferencing call facility for your business guests. Multilanguage selection: This allows international guests to use the system with ease. Room to room dialling: This helps guests to stay in touch with others in their party. This can be enabled or disabled on a room, group or system basis as required. Privacy: Guests can enable the DND feature to block incoming calls, or choose to have them forwarded to mailbox. This can be overridden in the case of emergency. Direct dial: Rooms can be telephoned directly from an external location if the guest chooses. Listen in/child monitoring: This allows the guest to monitor the room from another room or another part of the hotel, perfect for families wanting to keep an ear out for children. Recorded information: This allows you to record info about the hotel’s services or local information for guests, which can be accessed with one touch. Class of service: You can assign your guests different access rights to various features of the phone system and to outgoing call functionality – for example, depending on their room rate. Personalised service: If the guest’s name is entered on check in, this can be displayed whenever a call is made to or from their room (e.g. to front desk, room service, housekeeping etc) allowing for a more personalised experience. Warm welcomes: The guestroom IP Phone can also be used to deliver welcome messages and personalised greetings with guest name display for further personalised service. Room status: The status of any room can be checked from the front desk, to see if it is ready for your guest or still awaiting service. The cleaning team are able to update the status of the room from its guest phone. This allows you to keep your guest informed and offer an early check in where it is available. Call routing: This allows calls to be routed to the cheapest carrier. The guest is, however, charged at the full standard rate, allowing you to make more profit on guest calls. Multiple ‘front desks’: Front desk functionality is available from more than one point, allowing you to deliver a better service. Room extensions: The extension numbering can match the room numbering, up to 4 digits, making the system easier to use. One-touch services: The hotel’s facilities – front desk, concierge, housekeeping or restaurant, for example, can be accessed with a single number from any guest phone, for ease of use and maximising revenue opportunities. Cost control: The hotel phone system helps you keep track of costs, for example by adding bar and restaurant charges at point of sale. Vacant room barring: On check out, the guest phones are set to internal calls only to prevent misuse. Maid status for the room and any minibar charges can still be input into the system. Prepaid call limit: If a prepaid call limit is required, this can be entered by the front desk. This bars calls being made beyond the set limit until the limit is increased by front desk. Room changes: If a guest needs to move room, messages can be transferred from one mailbox to another. Listen receipt: Your staff can request a listen receipt to ensure that a guest has heard an important message. Announce only mailbox: This lets you set an announcement only mailbox which plays a message and then transfers the guest back to the main menu, allowing you to deliver services and promotions information where required. Faster service: Your staff can have WiFi and DECT handsets allowing them to be mobile and accessible around the building, and therefore provide faster, better service. Call centre features: These help minimise customer waiting time and boost your hotel’s marketing efforts. Integration with your CRM, PMS or sales database: This allows you to offer a personalised experience and tailor promotions to your customers’ needs. Integration is easy with Micros Fidelio, Tiger etc. Check in / check out: Routine tasks such as check in and check out can be performed efficiently, freeing up your team to spend more time looking after your guests. Having an effective hotel phone system can help you reduce costs significantly by using a single IP network to manage your voice and data communications, as well as reduce the cost of your calls using SIP trunks. This allows you to purchase the physical technology as and when you need it and expand as your business grows, avoiding expensive cabling and network operator restrictions. Attendant: Low cost Attendant software provides you with a simple, affordable way to control room status, handle room charges and communicate with guests. The interface can answer guest questions and manage requests, set multiple wake-up calls, DND and check-in/check-out. You can also record and replay guest calls or external calls and generate Call Record reports. This solution is perfect for small/boutique type hotels. Centralised management: Having a centralised, automated and remotely managed network helps you save money and increase your efficiency. It also enables you to receive email notifications when an alarm is triggered on the system, proactively respond to any alarms and significantly reduce the cost resulting from downtime. Less training required: A simple, intuitive system means less need for training within a busy hotel environment. Features are easy to use and self explanatory so your team will quickly become proficient users. Less power required: Your hardware (e.g. handsets) comply with the latest recycling directives and are extremely efficient, reducing the amount of power required for the system and helping your hotel to stay green. Open and standards based architecture: Your hotel phone system allows you to leverage the benefits of network services like SIP trunks that can drive down your call costs and deliver enhanced services. It is also easy to integrate cloud-based services and business continuity plans. iPECS handset The hospitality industry is saturated in man y areas of the Country and it has never been so important to maximise your revenue. An efficient hotel telephone system like the iPECS can support your efforts in doing this by engaging each of your customers and members of your team. Enhanced communication features allow each of your guests to access services and listen to information that allows you increase guest billing. In addition, call handling features help you capitalise on every opportunity to win business from incoming calls and website leads. 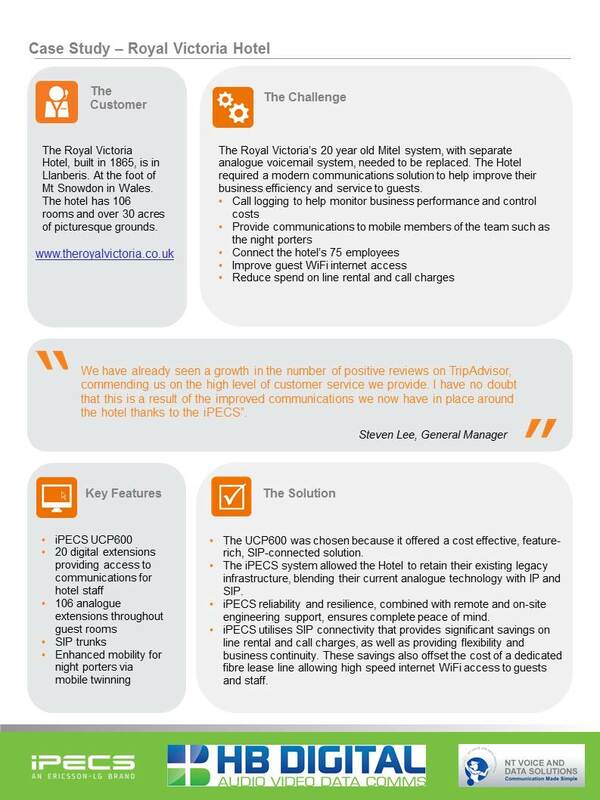 Find out how the HB Digital team deployed the UCP600 to provide a cost effective, feature-rich, SIP-connected solution for the Royal Victoria Hotel. Click here to view the case study. HB Digital supplies smart communications solutions for hotels in the North West and North Wales areas.